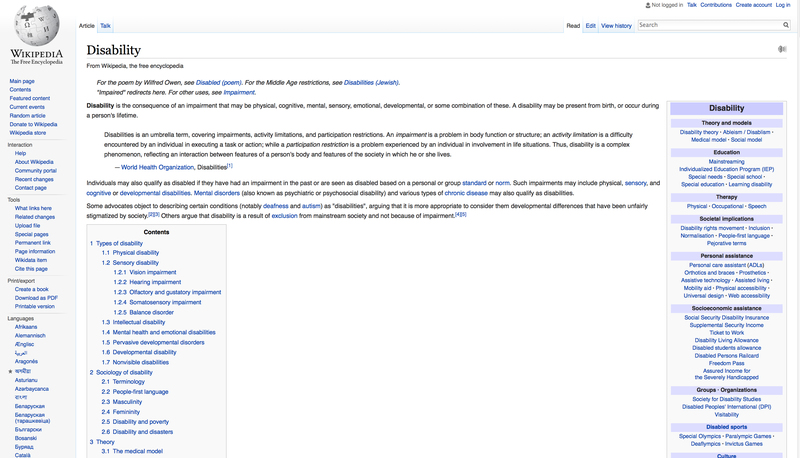 I’m posting here a quick status update on what my disability and media course has been doing in their work on Wikipedia’s Disability page. During a class meeting early in the semester, we spent a lot of time studying the page, thinking about how it framed disability, and talking about how to address what we saw as its major flaw: namely, that it hewed to the medical model. Four students are now involved in their own research projects — I’ve asked them to collect some reliable sources before they begin their editing — but in the meantime, I went ahead and began editing the page, since I realized that first and foremost we needed to get a taste of what responses we might get to our edits. Additionally, as someone with a deeper engagement with disability studies than my students, I thought it only right that I begin shaping the page so that it would openly address the many models for disability. To that end, I significantly changed the lead section; I also added a history section. Interestingly, as we’ve added more discussion of the social model to the page, other editors have chimed in that they too think the entire page needs to be overhauled to better reflect the social model. We’ll be making many more changes in the coming weeks, which I will continue to elaborate on this blog. For now, I’m including screen shots for anyone interested in following the story of how the page has changed since my class started working on it. If you’re interested in what the entire page looked like on January 8, I’ve saved a .pdf version that you can download here. There are additional significant changes further down the page. 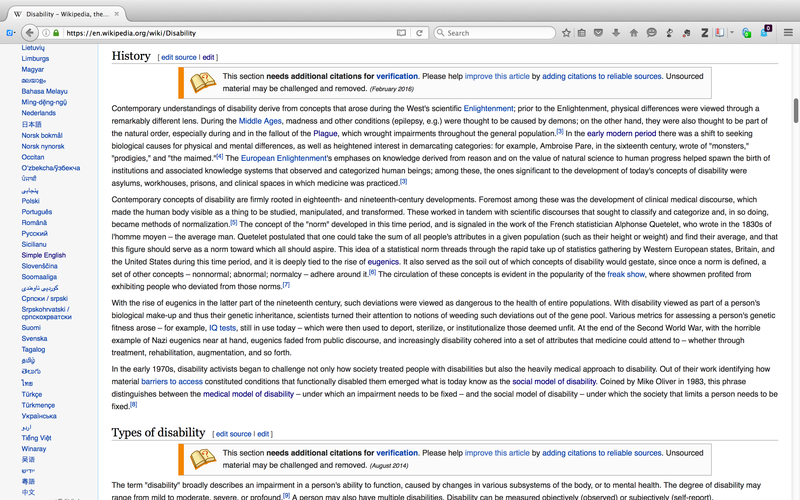 Visit it here: https://en.wikipedia.org/wiki/Disability. This entry was posted in Latest News on April 9, 2016 by obanner. Information about the UTDallas feminist makerspace is now available here: http://feministmaker.space/. This entry was posted in Latest News on March 6, 2016 by obanner. Digital Frontiers is happening tomorrow. See the lineup here. The temperature will be 99 degrees, and people, it is humid in the Dallas region. This entry was posted in Latest News on April 24, 2015 by obanner. I’m in the process of putting together an exhibit on the history of medical records. It is very much incomplete, since I’ve had to gather what’s available in local archives and have hit the usual issues that the 2003 HIPAA Privacy Rule, which applies to institutions that electronically record and transfer medical records, created for historians working in medical archives. You can view what I’ve thus far gathered here: http://cnx.org/content/m48765/latest. I’ll be speaking about those issues in the context of disability studies at the 2015 Digital Frontiers conference at UT Dallas. This entry was posted in Latest News on January 16, 2014 by obanner.